ww2dbaseTrafford Leigh-Mallory was born to a clergyman in Mobberley, Cheshire, England, United Kingdom. He attended Haileybury University and Cambridge University. At Cambridge's Magdalene College, he met Arthur Tedder based upon their shared interest for literature. He received the Bachelor's Degree in Law, and planned on pursuing the position of barrister when WW1 broke out. Instead, he volunteered to join a territorial battalion of the King's Liverpool Regiment in 1914. He was transferred to the Lancaster Fusiliers. He was wounded at the Battle of Ypres and returned to Britain in 1915, and married Doris Sawyer. He recovered from his wounds and joined the Royal Flying Corps, flying bombing, reconnaissance, and photographic missions. In Jul 1916, he flew over the Somme battlefield in a B.E.2 aircraft. Before the war was over, he also held the post of the commanding officer of the 8 Squadron of two-seater reconnaissance planes. He received the Distinguished Flying Cross for his service in WW1. ww2dbaseAfter WW1, Leigh-Mallory abandoned his aspirations in law and joined the Royal Air Force as the commander of the Armistice Squadron. He then went on to become the Inspector of Recruiting for a short period of time. After attending the School of Army Co-operation and the RAF Staff College, he became School of Army Co-operation's commanding officer between 1927 and 1931 while lecturing at the Army Staff College as an authority on air-ground joint operations. In 1930 he lectured at the Royal United Services Institute on air cooperation with mechanized forces. In 1931, he was appointed deputy director of staff studies in the Air Ministry. In 1932, he participated as part of the British delegation at the Disarmament Conference in Geneva. In 1934, he was appointed the commander of No. 2 Flying School at RAF Digby. He then served as the senior RAF staff officer in Iraq where he was commanded British and Commonwealth elements in protecting RAF bases against a coup d'etat in 1936. before becoming commander of No. 12 Fighter Group in 1937.
ww2dbaseLeigh-Mallory developed a well-known dislike for his superior Hugh Dowding. In Oct 1938, Leigh-Mallory, a proponent of large formation defenses, requested 29 of the 41 fighter squadrons to be transferred under his command in central Britain to serve as a large mobile striking force against any potential aerial invasion; this request was rejected. In Sep 1939, Leigh-Mallory and Dowding disagreed over the disposition of fighters in Leigh-Mallory's 12 Group. While Dowding knew of Leigh-Mallory's dissatisfaction with him, he did not know that, after a particularly heated argument in Feb 1940, Leigh-Mallory told fellow group commander Keith Park that he would do his utmost to get Dowding removed (something Park never revealed to others until 1968). ww2dbaseAfter Air Chief Marshal Charles Portal took command of the RAF, the new commander agreed with Leigh-Mallory's view and removed Dowding (along with Park) from their posts, transferring Park's No. 11 Fighter Group under Leigh-Mallory's command. Because of this transfer, Leigh-Mallory had been criticized for usurping Dowding and Park's power. Generally speaking, however, most of his peers respected him more so than they did with Dowding, although he commanded less respect from his subordinate officers than those of Dowding's. In 1942 Leigh-Mallory was made the commander of air forces at the Dieppe Raid. In Nov 1942, he was appointed Air Marshal of Fighter Command. He was knighted (Knight Commander of the Order of the Bath) in Jan 1943. He was known for the deceptive technique of having high-flying fighters draw enemy fighter defenses while sneaking bombers below at low altitude. In Aug 1943, he was appointed the commander of the Air Forces of Allied Expeditionary Forces under the command of Dwight Eisenhower. He had lobbied hard for such an overall command against heavy political opposition over the previous year. ww2dbaseSubsequent operations in Europe led to political conflicts between Leigh-Mallory, wrestling control of air forces among RAF leaders. While his "Circus" operations (wing-sized fighter formations sweeping enemy movements on the ground) kept German movements in check, his strategy of bombing transportation nodes, which almost always coincided with French towns and cities, drew criticism. Despite his valiant efforts to strike down German V-1 launching sites, his effective coordination the air defenses of Britain, and the close air support that he provided, he resigned under political pressure. The other air commanders such as Arthur Harris and Carl Spaatz thought Leigh-Mallory's insistence for a single command for all air operations was out of his personal ambition. However, Bernard Montgomery maintained that Leigh-Mallory was "the only airman who is out to win the land battle and has no jealous reactions." ww2dbaseIn Aug 1944, Leigh-Mallory was transferred to South East Asia Command as the Air Commander-in-Chief. Before he actually took command, however, he passed away as a result of a plane crash in the Alps. All on board, including his wife, died. Bad wether was to blame for the accident. 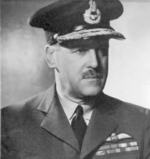 Leigh-Mallory's political rival, Air Marshal Sir Keith Park, was appointed to take up the position at South East Asia Command after Leigh-Mallory's death. ww2dbaseLeigh-Mallory's legacy is a divided picture, with some criticizing him as a politician who placed personal ambition over the war effort, while others praised for his selfless dedication and his brilliant air strategies. In Oct 1944 when Leigh-Mallory left for his new position in Burma, Eisenhower noted that "[a]lthough reluctant to lose him, our organization had, by that time, definitely crystalized and teamwork had been perfected to the point that I appoved the transfer." Though a rather politically-minded statement, Eisenhower did add that, upon learning of the crash, the Allies had lost "one of the intrepid and gallant figures of World War II." 11 Jul 1892 Trafford Leigh-Mallory was born. 4 Dec 1937 Air Vice Marshal Trafford Leigh-Mallory became the commanding officer of the No. 12 Group RAF. 28 Nov 1942 Air Marshal Trafford L. Leigh-Mallory took over RAF Fighter Command from Sholto Douglas. 14 Nov 1944 Air Chief Marshal Trafford Leigh-Mallory died in an air crash; his body was not found until 4 Jun 1945. 4 Jun 1945 The body of Air Chief Marshal Trafford Leigh-Mallory, who died in an air crash, was found. Leigh-Mallory was a keen sailor. After one of his children survived a serious illness he also became interested in faith healing and spiritualism. In one anecdote he suggested hed seen the ghost of Mrs Emily Langton Massingberd, the womens rights campaigner, at Gunby Hall in Lincolnshire. When the Hall was threatened with demolition during the Second World War to make way for an airfield, Leigh-Mallory intervened to save it. It is now in the hands of the National Trust. I need primary resources badlyyyy! !